Sulte Group CEO Teju Owoye takes the customer-creation concept one ambitious step further. 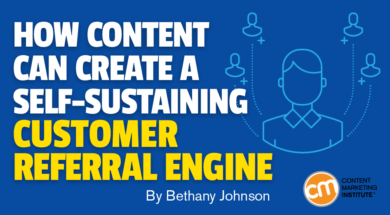 Your content can create a self-replicating referral engine, as Teju shares in her Content Marketing World presentation Accelerating Growth by Hacking Your Conversion Journey. To get there, though, you first must help users learn to love the product or service they just signed up for. In the conventional sales and marketing funnel, marketing teams work on building awareness and nurturing prospects so some become leads and some eventually purchase a product or service. It’s tempting to celebrate those wins. “It’s super exciting that you’ve got the customer to purchase your product, your service, engage with your platform,” Teju says. But, what most marketers call “conversions” are truly a relatively minor transactional event that signals the start of a change. What happens next can determine who does the bulk of your future funnel-filling work — you or your happy customers. “Marketers need to be intimately involved post-conversion to make sure that the customer is not only utilizing the product, but they become evangelists — and they’re referring their counterparts, their friends, their family, whoever is in their sphere of influence,” Teju says. To boost growth, Teju suggests you guide the newly converted (through personalized content delivered at key moments) to become a different kind of customer ­­– an active user who gets so much value from your product or service that the impulse to share it with others is almost irresistible. What is it about our favorite product or service that make customers really love it? How does it make their lives easier? How does the brand respond when they have questions or problems? How does the product or service assimilate into or effect other aspects of their lives? Does their behavior change because of how they feel about the user experience? Or do their feelings change because of the new behavior once equipped with the product? Good consumer sentiment prompts behavioral change. It’s no surprise that when customers feel a product or service can ease their pain, they engage with it. But did you know that the opposite is true? Customer behavior can change how a customer feels. The more people act like power users, the more they feel like they are power users. The result is a magical, self-perpetuating brand advocate (a power user). To bring the behavior-drives-feelings concept down to earth, Teju describes a client whose goal was to popularize its software — an app that powered a cash-back rewards program. First, they dug deep into website tracking data to identify a handful of behavioral markers that distinguish their most active, engaged, happy customers — in other words, the super users. Super users linked their credit cards to the mobile app right away. Immediately after signing up, they navigate their way to the “link-a-card” function, and they make it happen. Within the first seven days, super users visited about four restaurants, usually around lunch time on weekdays. Over the next couple weeks, they linked more credit cards — three on average. The brand used the findings in a surprising way. 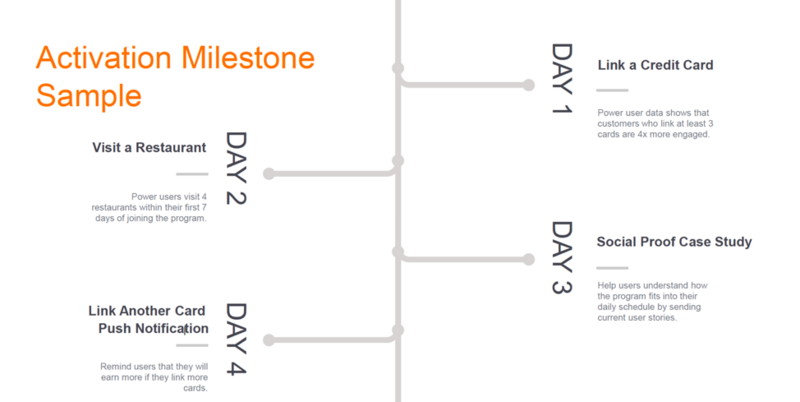 Instead of going out to find new potential power users, Teju says, the team set out to create new power users within the existing subscriber base by developing a calendar of activation milestones. 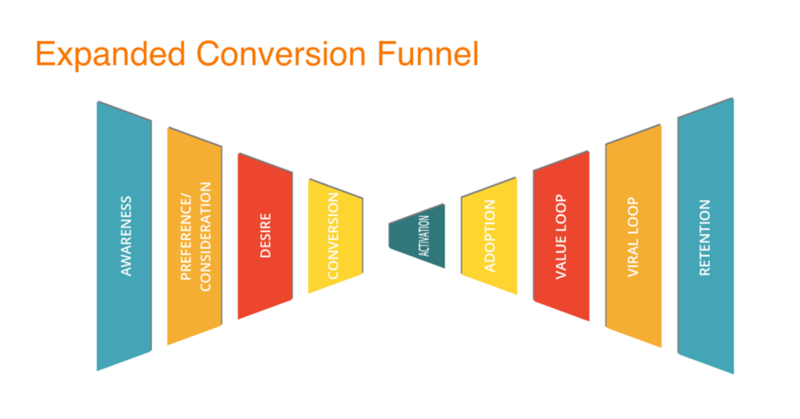 The goal of this message is to motivate an otherwise lukewarm customer to hit what Teju calls an “activation milestone.” In the expanded funnel, activation is the step that prompts people to really unlock the features of a product. The marketing team did not expect an emotional investment in the program right away. That could come later. At this stage, a user’s actions mattered most. “Looks like you haven’t tried using our app at a restaurant quite yet. Doing that separates our most well-rewarded ($$$!) app users from people who don’t get as much out of the experience. The goal was to get this person to adopt the product or service and use it as a power user would. Incentives were a great way to achieve that goal ­­– especially when your product rewards users organically in time. For example, this software company realized an aha moment would come for users who took enough power-user actions. A supremely gratifying moment would happen when the user would look down to find a fulfilling $10 reward on the app – just for continuing his usual spending habits. Often, Teju says, the moment was so powerful the user remarked aloud to friends and family in casual conversation, creating a genuine word-of-mouth referral that sent new prospects right to the app. Get this right, Teju says, and you’ve not just created a loyal customer, you’ve created a potential viral loop, the self-fueled engine of word-of-mouth marketing. Much of today’s content endeavors to spark a feeling or perception. It’s tempting to try to convince consumers of their own desire for your solution – to make promises, brag, or otherwise compel audiences to a faux enthusiasm. When maybe, just maybe, another tactic could be to move them one step further toward power-user behavior. The closer their behaviors inch them toward your product’s built-in rewards, the sooner they reach that natural aha moment. And that’s the kind of moment they can’t help but share with others. Want more pause buttons, truth bombs, and aha moments of your own? Register for Content Marketing World Sept. 4-7 in Cleveland, Ohio, and earn a $100 discount when you enter code BLOG100.